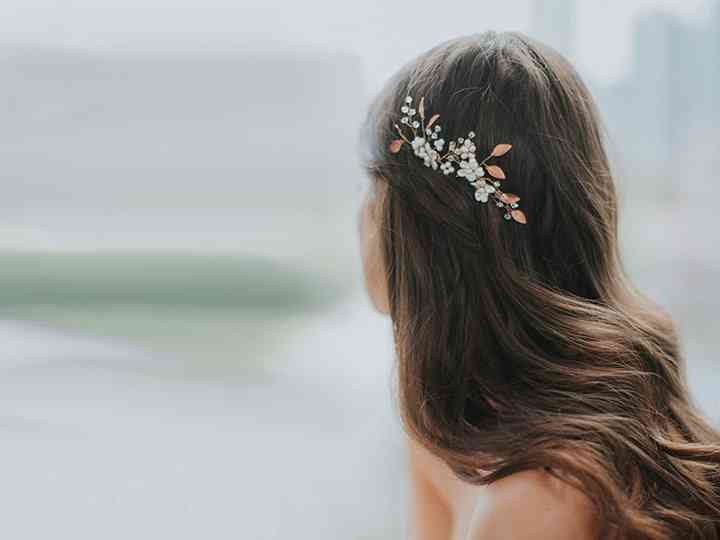 Wedding Hair Accessories Glossary | Wedding Ideas ARE YOU A VENDOR? Don’t know the difference between a crown and a hair stick? 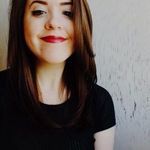 Here’s all the important words to know before hitting the hair salon. An accessory that is secured to the back of the head. It can sit above or below an updo. The veil is typically fastened to it. A hair clip that snaps together. They come in a variety of different sizes and can be embellished with everything from flowers to sequins. An accessory that wraps around the bun to enhance its look and hold it in place. It sometimes boasts pearls, jewels or flowers. A large, decorative hair pin that resembles a comb. They have several prongs and often feature jewels, pearls or flowers. 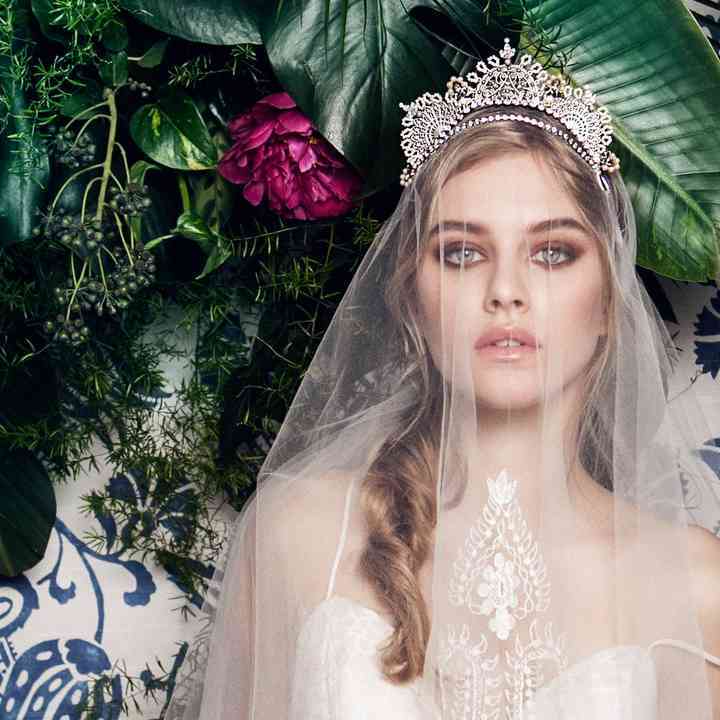 More than just an embellishment, they work to hold the hair (and sometimes veil) in place, eliminating the need for excessive amounts of pins. A diadem in the shape of a full circle that rests on the top of the head (different than a tiara, which is a semi-circle). They are usually used to amp up simpler hairstyles. A real or faux flower piece that wraps around the entire head. Very boho. 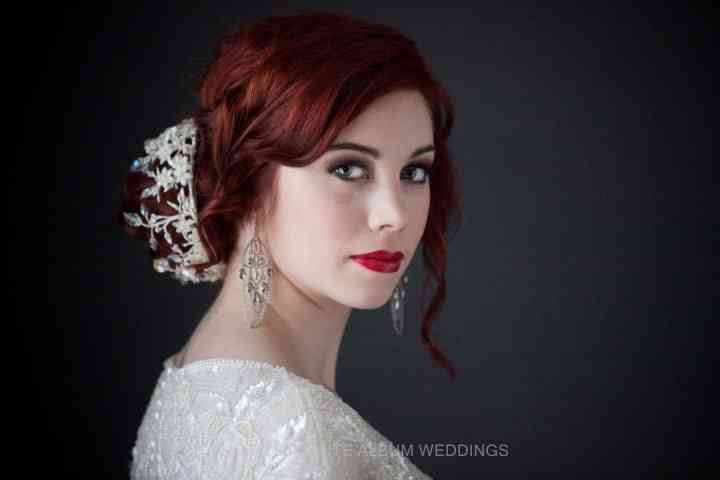 A statement headpiece that is attached to a comb or clip. 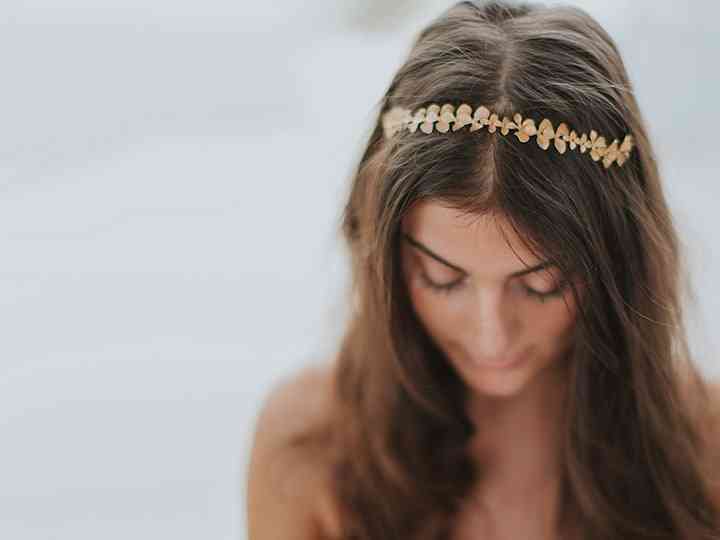 They are larger and more dramatic than most bridal hair accessories and usually boast feathers, flowers or beads. A U-shaped pin with ripples halfway down both sides. They are typically used to hold buns and chignons in place. 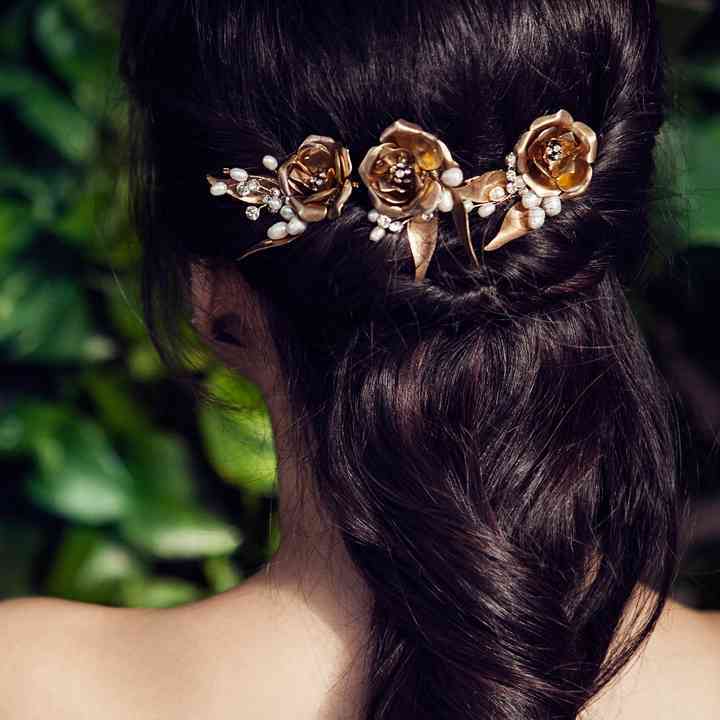 A hair accessory that imitates the look of a vine with crystals or jewels. They are usually pliable, so you can bend them to best suit your ‘do. They are attached to hairpins or bobby pins, making them easy to put on. A band that sits close to the hairline or across the top of the head. They come in all shapes, sizes and materials. A fitted cap that is typically made of lace and embellished with beads or pearls. A semi-circular crown. They are usually dressed up with pearls or jewels. 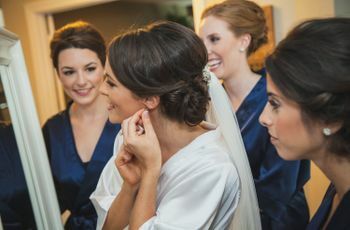 Your perfect wedding ‘do will probably involve knowing a bit about wedding hair accessories - and there’s a good chance you won’t be familiar with all of them. 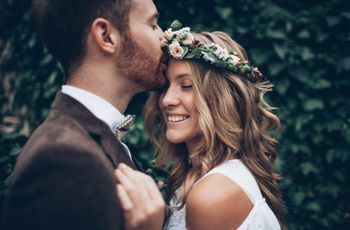 To avoid referring to your wedding hair stylist’s bits and bobs with made up names you may want to familiarize yourself with the language. 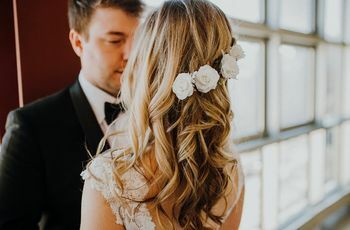 If you want to get beauty schooled before hitting up any hair trial appointments, we have a slideshow and glossary of all the different types of wedding hair accessories. 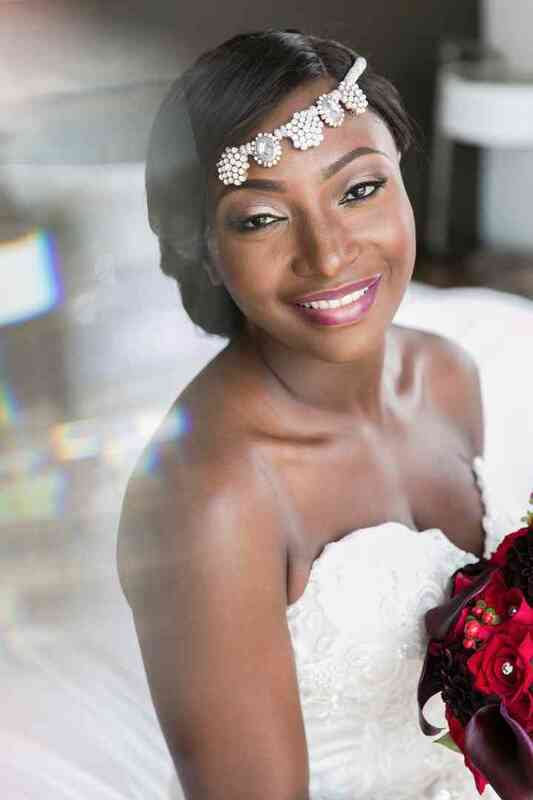 Here is a glossary of wedding hair accessories. Backpiece: An accessory that is secured to the back of the head. 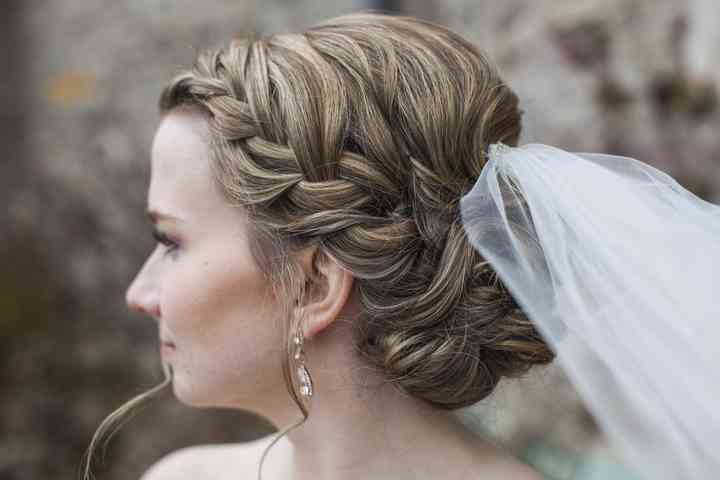 It can sit above or below an updo. 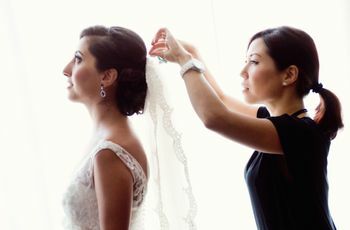 The veil is typically fastened to it. Barrette: A hair clip that snaps together. They come in a variety of different sizes and can be embellished with everything from flowers to sequins. Bobby pin: Small hairpins with one flat edge and one rippled edge. They are used to keep buns, ponytails and updos from undoing. Bun wrap: An accessory that wraps around the bun to enhance its look and hold it in place. It sometimes boasts pearls, jewels or flowers. Comb: A large, decorative hair pin that resembles a comb. They have several prongs and often feature jewels, pearls or flowers. 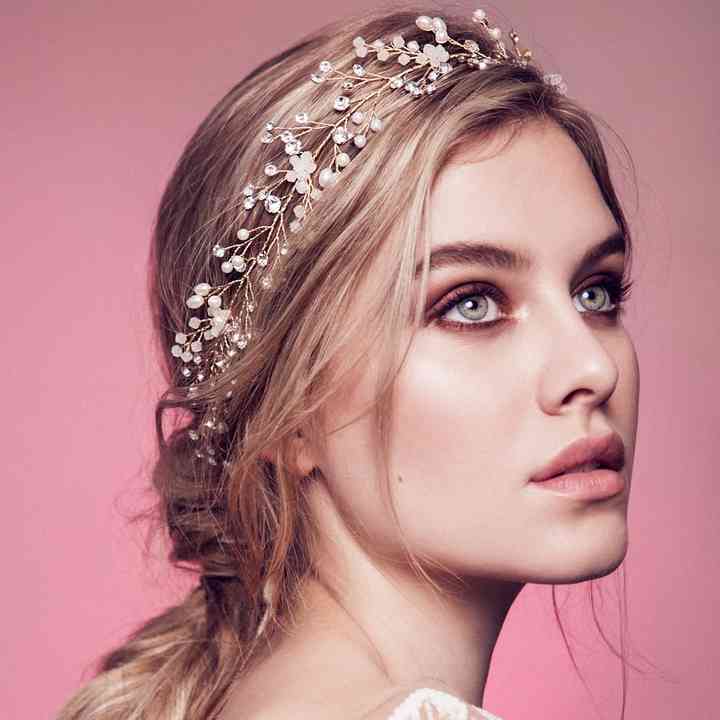 More than just an embellishment, these wedding hair accessories work to hold the hair (and sometimes veil) in place, eliminating the need for excessive amounts of pins. Crown: A diadem in the shape of a full circle that rests on the top of the head (different than a tiara, which is a semi-circle). They are usually used to amp up simpler hairstyles. 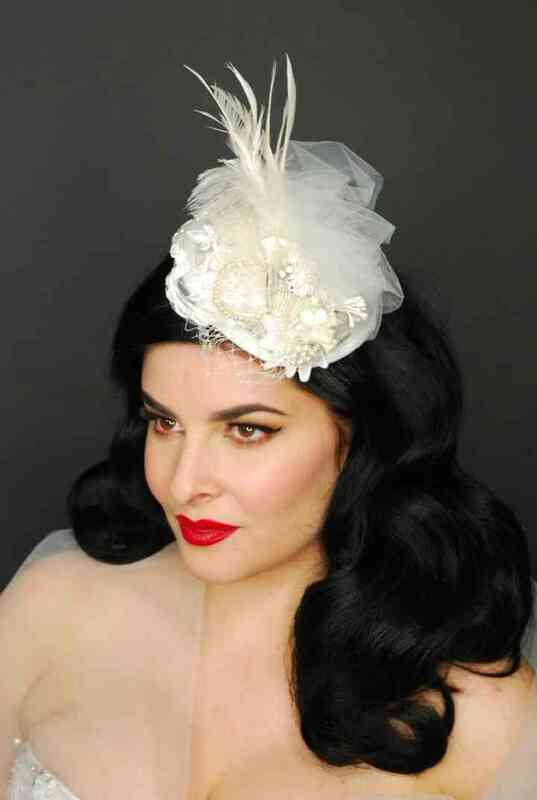 Fascinator: A statement headpiece that is attached to a comb or clip. They are larger and more dramatic than most wedding hair accessories and usually boast feathers, flowers or beads. Flower crown: A real or faux flower piece that wraps around the entire head. Very boho. Hairpin: A U-shaped pin with ripples halfway down both sides. They are typically used to hold buns and chignons in place. Hairstick: A small stick with one pointed end that is used to keep an updo in place. They can be minimalist or involve embellishments. Hair clip: A clip that holds a hairstyle in place with a set of teeth. They come in a variety of shapes and sizes. 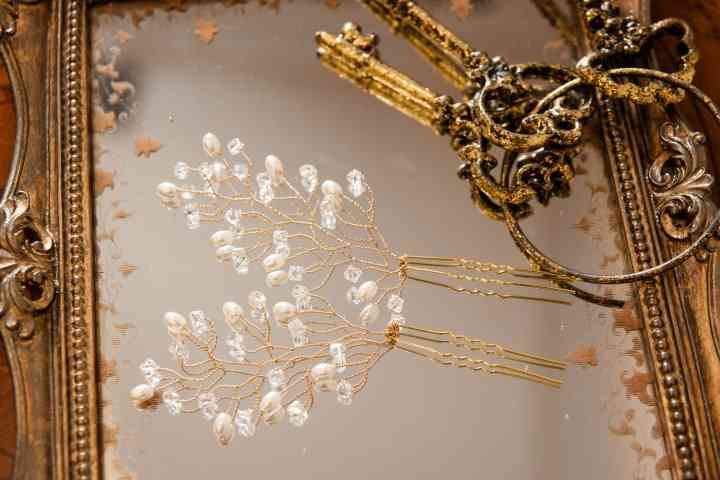 Hair vine: A wedding hair accessory that imitates the look of a vine with crystals or jewels. They are usually pliable, so you can bend them to best suit your ‘do. They are attached to hairpins or bobby pins, making them easy to put on. Headband: A band that sits close to the hairline or across the top of the head. They come in all shapes, sizes and materials. 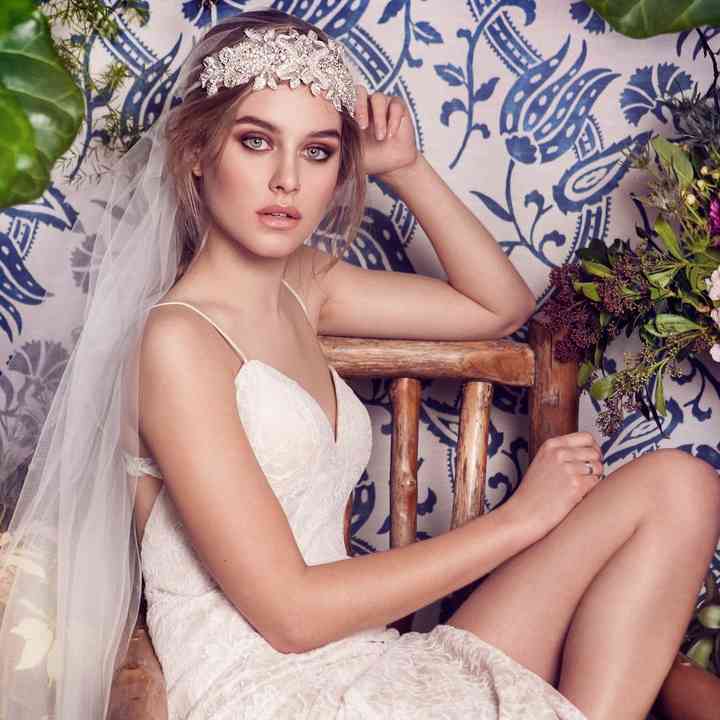 Juliet cap: A fitted cap that is typically made of lace and embellished with beads or pearls. 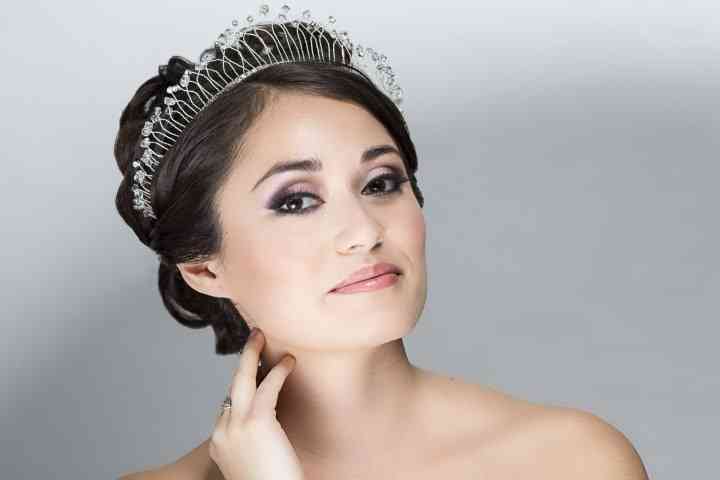 Tiara: A semi-circular crown. They are usually dressed up with pearls or jewels.